As of Parts Tracker v4, you can set up scheduled shift tasks. These are tasks that need to be performed on a regular basis – e.g. daily, weekly, etc. Common examples for an 8290 are: cleaning distributor belts, elevator belts, changing ball wiper cloths, mopping carpets, etc. The Shift Task List shows the tasks scheduled to be done for the current shift. As work is completed, you tick off the items in the list. Some tasks require selecting machine numbers (e.g. a task involving servicing two machines per day would automatically prompt the user to choose two machines). You can also scroll to other days in the past to see what work was completed, and to days in the future to see what work is coming up. So how do shift tasks end up in the list? That’s where schedules come in to play. Read on! 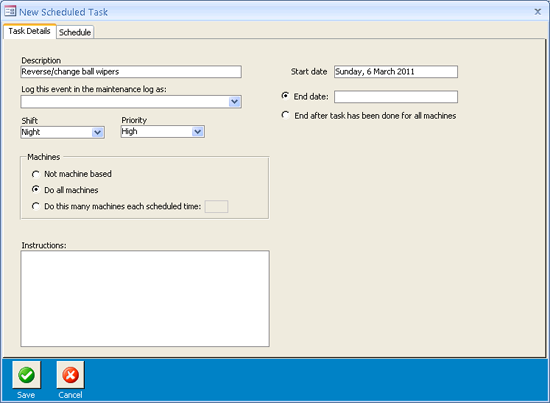 Scheduled tasks are created in the Manage Shift Task Schedules screen. In this screen you specify the details of the task, including the name/description, priority, the shift it occurs on (or no shift), the range of machines to be done each time. Now comes the important part: the schedule. 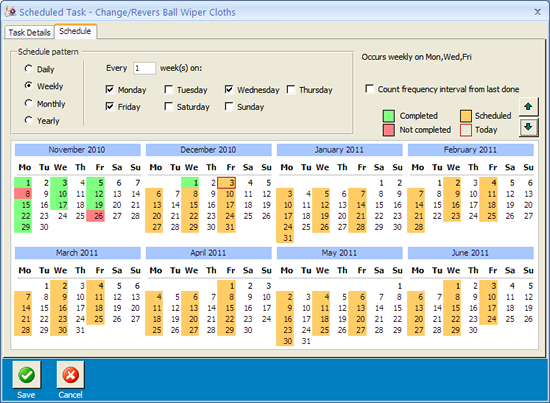 Parts Tracker supports a range of schedule frequencies: daily, weekly, monthly, yearly, with several options for each such as the interval (every 2 days, every 2 weeks, etc) and the days of the week. An additional option is to also specify that the task should occur based on the time since it was last done. For example, a task can be scheduled to occur every 7 days and if it doesn’t get done on the 7th day, it will remain in the list until done. Once done, it will then not appear again for another 7 days. And that’s it. 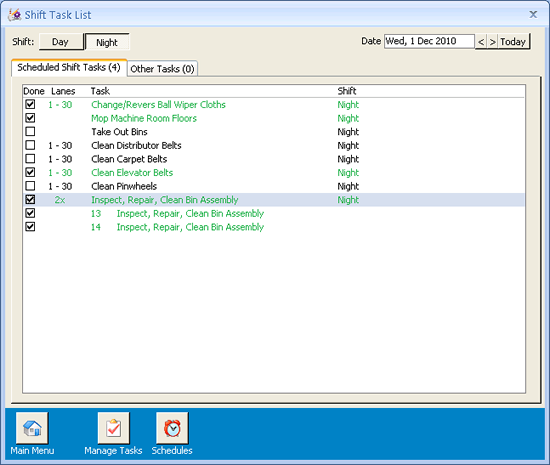 Now the task will appear in the task list on the right days following the schedule.